"Central Illinois is our Business"
Thrift Trucking currently has 3 locations and prides itself on its experienced and courteous drivers, friendly operations staff, and excellent customer service. Thrift Trucking has been serving central Illinois’ air freight, truckload and transportation needs for over 25 years. Thrift prides itself on its experienced and courteous drivers, friendly operations staff, and excellent customer service. We have a wide range of services available designed to provide flexible solutions for your LTL / LCL and FTL shipping needs. With seven evening line haul trucks to Chicago and two daytime line hauls to Chicago, Thrift is able to provide next day service to over 1,000 cities throughout central Illinois. Thrift Trucking’s full truckload service provides regional and national options from all 3 of our locations. All of our employees are TSA and STA compliant. (Click here for more information.) Our state-of-the-art software system provided by Crown Data Systems enables us to quickly retrieve information about your shipment and automatically email or fax POD information and charges. Our office hours are 6:30 a.m. to 9:00 p.m. CST. If you need to reach us outside of our regular business hours, we do have an answering service which can reach a Thrift employee on call. Not a Thrift customer yet? Simply click on our printable credit application to apply for credit today. "Great carrier to work with! on time deliveries and great communication! Thanks for all of the great work, can't wait to work together in the future." 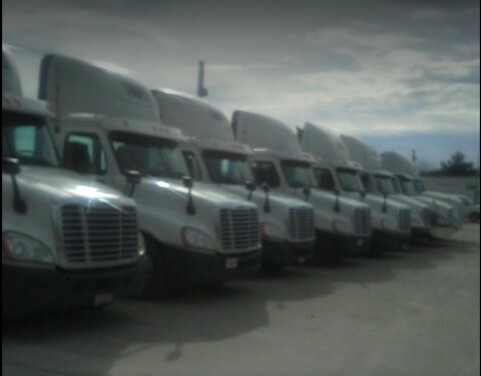 "We use Thrift Trucking weekly for full truck load shipments. They are always fantastic to work with and keep me informed every step of the way via email or phone call. I have used their services for a number of years now and would highly recommend working with them for any of your full truck load needs. If you need a carrier you can trust and depend on then Thrift is no doubt the best choice in my opinion."